We love brunching, we frequently find ourselves trying out new places in town (like here, here or here) or venturing to old standby’s (including here, here, here and here) when the world is still quiet and sleepy. Every now and then we are lucky enough to be invited over to friends’ houses where we can nibble bites and sip our coffee at a more leisurely pace. 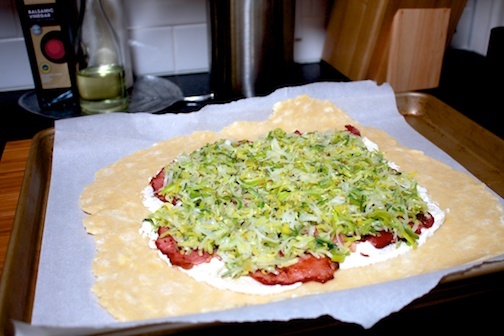 A few Sunday’s back, we were just in luck and threw together a spring onion and leek crostada with back bacon and ricotta…all thanks to our CSA box from that week. When I started cooking the back bacon – I’ll explain what it that is in a minute…I didn’t really have a firm plan about when I was making and how it would take shape. When this happens, sometimes the end product is brilliant…and other times, well…that is when it’s time to stop by a bakery on your way over. This time, it was lovely! The spring onions and leeks from our CSA box were too beautiful to not use and they screamed to be the feature of a dish. So back bacon is not made from pork belly – it is the center cut boneless pork loin and is much leaner and meatier than regular American bacon. It might also be labeled as Irish bacon. It can be tricky to find so regular, good ‘ole bacon will do just fine. We found it at a Fresh & Easy market, whose parent company is British…which explains why they carry it. I started by washing the leeks and then slicing the leeks and the spring onions into very thin slices. The ramekin in the back holds none-other than rendered bacon fat. We always have it in the fridge and it keeps very well. Whenever you cook bacon, just strain the warm oil that was left in the pan and cool, then place in the fridge. Dare I say, it makes a decadent grilled cheese and it is very spreadable! 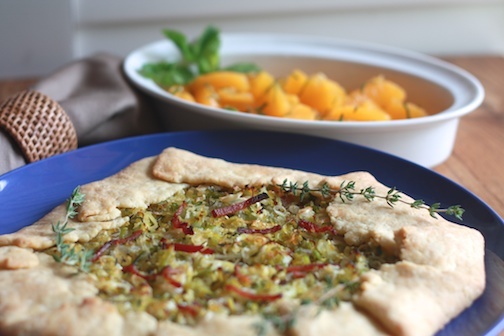 I also prepared a short crust – something like you would use in a tart or a quiche – generally it is just flour, salt, cold butter chunks and a little ice water. Whenever you are making a pastry dough, it is important to let it rest in the fridge for at least 30 minutes before you roll it out. Which is plenty of time to slice and cook your onions and leeks and cook the bacon. I sautéed the onions and leeks in butter and some of the bacon fat for about 5 or 6 minutes as I wanted them to sweat but not gain any color, and I seasoned them with fresh thyme. Turn the oven on to 350º so it has plenty of time to reheat. 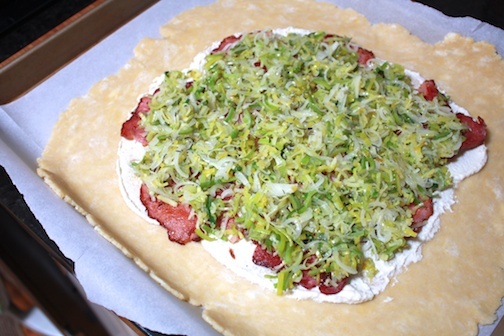 Next, I rolled out the crust and placed it on a piece of parchment on a half-sheet pan. We had some ricotta left in the fridge which was perfect because this crostada needed something to hold it all together and work as a base. I thinned the ricotta just a bit with some heavy cream and of course, seasoned it with salt and pepper and a little more of the fresh thyme. Spread it evenly on the rolled out pastry leaving a 1-2 inch border on all sides and top with the back bacon slices leaving at least 1 piece to sprinkle on top. Next, spread the spring onions and leeks over the top and top with another sprinkle of salt. Now, fold the pastry in towards the center starting on one edge and working your way around. A crostada is not a fancy food…so it does not need to be perfect! Top with the last slice of bacon either sliced or crumbled. Count yourself lucky if you manage to hide the last piece from your husband who is trying to sneak as many nibbles as he can blaming his actions on pure famine! 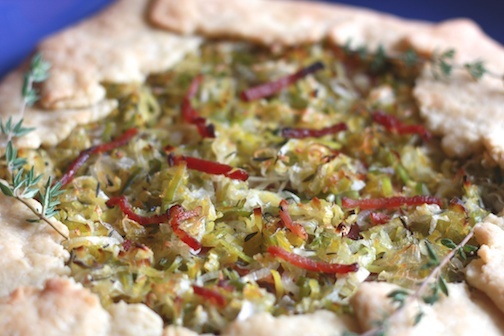 Bake for 15-20 minutes or until the crust is nicely browned and some of the onions and leeks have crisped on top. Our CSA box had also arrived full of late harvest citrus and some fresh mint…so we brought those along with us as well. Start by slicing off the top and bottom of the orange and then slice the peel and as much of the pith off of all sides. When serving citrus served like this, it is best to ‘supreme’ the fruit…I can’t figure out an easy way to write up instructions for you…but I found a great video on youtube that will show you exactly how to do it here. Next, chiffonade some mint and toss it with the segments of orange – very refreshing and easy to eat as there is no pith or seeds to pick out of your teeth. The crostada is delicious warm or room temperature and was a delightful addition to the brunch buffet. 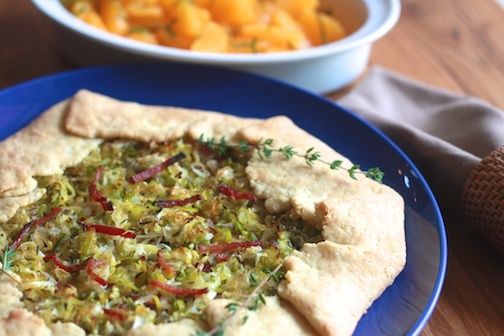 It was crumbly and savory, with a nice oomph of onions and leeks! What dishes have you made that turned out surprisingly well despite no real plan when you started? 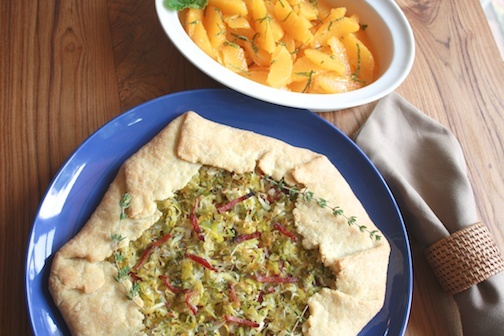 We are always on the lookout for new recipes that travel well…what are your favorites for a potluck brunch? I was intrigued with the challenge this month and was excited to try a couple of the recipes…unfortunately…somehow July has been a challenging month to find the time. I was able to complete the challenge on time…but getting a post written is often times the greater challenge. First, toast up your pecans to deepen the flavor – put them in a dry skillet over medium heat and give the pan a shake every so often. Make sure just to toast – not burn…and this burning I speak of can happen quite fast…so no walking away from the stove and forgetting about what is going on. Next, prepare the pecan cream. Grind pecans in a food processor for about a minute or so until smooth, scraping down the sides of bowl as needed. Add water and 3/4 teaspoon (3 ml) salt; process until smooth, scraping sides of bowl as needed. Set aside pecan cream. Yummm….delicious nutty cream (sans cream). Pound chicken to 1/2 inch thickness to promote even cooking. Sprinkle with a bit of salt and pepper to taste. Heat 1 teaspoon olive oil and a little butter in a large nonstick skillet over medium-high heat. Add the chicken; sauté 3 to 5 minutes on each side or until cooked through. Set aside cooked chicken on a clean plate, cover to keep warm. Chop the shallots and slice the mushrooms. Add deglazing liquid to pan if using and stir up any browned bits – these are my favorite part. The browned bits. If needed, add another teaspoon of oil (or more) to pan for sautéing the shallots and mushrooms. Sauté the shallots and mushrooms over medium heat for 4 to 6 minutes or until mushrooms are tender and starting to brown. I am drooling…I love mushrooms…especially when combined with butter and some kind of oniony thing. Add fresh thyme to the pan. Stir in pecan cream; bring to a boil. Reduce heat and simmer for about 1 1/2 minutes till reduced slightly. Slice the chicken breast, place atop egg noodles and ladle the pecan cream over the top. I finished the dish with some microgreens! One would SWEAR that there are LOADS of cream, heavy cream, whipping cream…in this dish…but alas there is NONE! This will definitely be a keeper for those times when we’re entertaining any lactose intolerant guests. Also…it was just good. The sauce keeps a bit of the graininess from the chopped pecans and is rich and decadent. Be careful not to over-salt the pecan cream…it’s hard to fix that one. We still have lemons. Many lemons. Apparently we have one of the most productive ever-bearing Meyer lemon trees on the planet. And it is now flowering again…and being pollinated and will therefore be producing more fruit in the near future. So my hunt continues for interesting and creative ways to juice, squeeze, preserve, cook with and bake with Meyer lemons. Thoughts, recipes, ideas are welcome! I found a recipe for this Meyer Lemon Cake in this book. First, start with Meyer lemons, zest them, and juice them. The recipe calls for approximately 8 lemons. I must have some really juicy lemons, because I only juiced 3.5 lemons and had more than enough juice for the cake. Eggs are separated and whites are whisked until you have stiff, but not dry, peaks. Copper bowl is not required…just fun to use if you have one. I had to ask Woody if I could use his – as it was a Christmas gift after a very long and extensive search for a true copper round bottom bowl that wouldn’t break the bank – he’s always wanted one. Permission was granted. Eggs, lemon juice, sugar – beaten and frothy. Flour added to egg yolk and sugar mixture. I know you were dying to see the inside of my oven…so here it is! I used a mini-bundt pan and a regular sized bread loaf pan – the proportions look very strange in the photo above if you weren’t aware of the mini-bundt. Pulling them out of the oven and unmolding them revealed a delicious and perfectly toasty golden color to the cake. This was perhaps the 4th or 5th glazing…all of it pooled on top would sink right into the cake and it would once again look as if it had just been taken out of the pan. Don’t let your glaze cool too much, otherwise it won’t be viscous enough to soak in. Also, you should poke more holes than you think you should. Poke the skewer in 8-10 times and then poke it again and again and again! I had plans to candy the thyme…but funny enough, I ran out of time. HA! Melt butter in a saucepan, set aside to cool. In a mixing bowl, beat together the egg yolks with 1 cup of sugar, until thick and light in color. Beat in the buttermilk, lemon juice, and zest. Sift together the cake flour, baking powder, and salt. Beat the egg whites until soft peaks are formed. Add the remaining quarter cup of sugar, then continue beating until stiff peaks are formed. Alternately fold half of the flour into the egg yolk mixture, followed by half of the egg whites. Fold carefully as not to deflate the batter. Repeat with remaining portions. Take approximately 1 cup of batter and stir into the melted butter. Gently fold the butter mixture into the cake batter. Pour into a buttered, and floured, 9-inch cake pan, springform pan, bundt cake pan, bread loaf pan – really any pan will do. Bake for 50-60 minutes – this time varies depending on the type of pan you use. Always test the cake for doneness with a toothpick or skewer. No one likes a dry cake. While the cake is baking, make the glaze. Combine the lemon juice and confectioners sugar. Heat in a saucepan just until sugar is melted. Set aside until cake is done. I found that the volume of glaze was more than I needed, but I am also a little hesitant about soggy cake. I probably could have used more. It’s delicious stuff! When the cake is done baking, cool for 5 minutes in pan. Turn the cake out on a cooling rack, and invert. With a long toothpick or skewer, poke the top of the cake making small holes. Slowly spoon on the glaze. Wait for the glaze to sink in, then add more. Repeat process until all of the glaze is used. Cool cake completely, and enjoy! For an extra ooommph at the time of plating – drizzle the glaze over each slice and top with a dollop of freshly whipped cream. Bone-in Pork Chops with a quick Whiskey, Thyme, Shallot pan sauce served with Roasted Brusels Sprout and Mashed Sweet Potatoes. It was delicious and only took about 45 min. to make – including prepping all the veggies. This dish will be added to the ‘make again’ category!